You know how you look at all the curriculum you’ve ordered and then you have a panic attack? Yes, you’re wondering how you’ll ever have time to fit everything in to your homeschool day. You’re suddenly aware that there is only 1 of you, a mountain of books, and some possibly less than eager students. So, what do you do? You make a schedule! I create a very colorful, very detailed schedule in a spreadsheet. That’s because I’m very Type A and I love colorful things. You could keep yours simple or you could go crazy and make a sticky-note schedule. It doesn’t matter as long as you take the time to write one out. It keeps me from being overwhelmed. When I see all of our subjects spread out over the course of the day and see that we do have time to get everything done, I feel less stressed. It shows me what’s actually important in our homeschool day. By creating a schedule I sometimes find that there is no way a certain subject, topic, or commitment will fit without sacrificing other things that I deem more important. This helps me eliminate things that are not a good use of our time. It ensures that I cover every subject for each child. I often worry about forgetting something or skipping a subject. With a schedule, this never happens because I know each subject is scheduled into our day and I know that we will cover what’s important for our school year. It helps me make time for each child individually. When I create my schedule I make sure each child has their own time slot throughout the day. This makes sure that my preschoolers are not overlooked and that everyone gets some individual time with just me. It gives my kids a flow and structure and sets expectations for our day. I need some structure to our day and I find that my kids do best when they know what comes next and what is expected of them for each day. Having a written schedule gives them the security of knowing what comes next and what a school day entails. Did you know that I don’t always follow my schedule? It happens. But I still have my schedule and it still helps me get through most of my homeschool days. 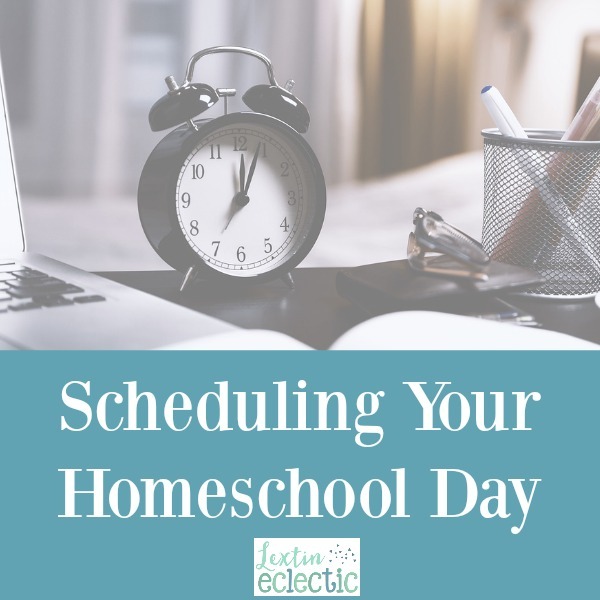 Because I can clearly see that yes, everything can fit into my day, I feel a lot less overwhelmed at my daily task of homeschooling. It keeps me focused on what’s most important and helps me remember subjects that I’d like to forget. How did I create my schedule? I began by assigning a color to each family member. This is because I love colorful things and I’m a visual person. I gave myself green because it is my favorite color! I then chose pretty shades of my kids’ favorite colors. Ladybug and Punkin didn’t have favorite colors at the time so I chose for them. We’ll see how they feel about that later…. Then I wrote out my schedule on paper. I can’t think when I’m typing out something as complicated as our schedule. It started with a paper, a ruler, and a pencil. I made columns on a blank piece of paper, wrote names at the top with times down the sides. I scheduled everything in 30 minute increments to keep it simple. Then I started filling in possible subjects. After moving things around a million times and realizing that some things might just have to be deleted in the name of “not having a clone” and only so many hours in the day, I found a way to make all the priority subjects fit into my schedule. In scheduling the time slots I thought about the subjects that I would need to teach to each child, the subjects that could be completed independently, and the subjects that could be completed with an older sibling’s help. This helped me make the best use of my time and ensure that each child had time with me. But it also gives my children a head start in learning responsibility because sometimes they are in charge of helping a sibling with some school work during a certain time slot. For example, Tiger might help Bee during some computer time or Curly might read to Tiger. After I had a good draft on paper, I put it all in the computer in a nice spreadsheet. I put the times down the left side and filled in the column for each person. Then I added the color. I changed the color under my name to correspond with the child that I would be teaching at each time interval so I could quickly glance at my schedule and know who had a turn with me during that time slot. I also matched the colors of a younger sibling working with an older sibling by coding both of that slot with the color of the younger sibling to remind me that the older child was being my teacher’s helper during that time slot. And once my schedule is done I take a week and put it into practice. Then I usually refine it a few more times before I find the perfect flow to our homeschool days. I wrote about hiw we schedule today too! 🙂 I've been loving your Hey girl graphics this week. Aww thank you! I thought they would be something fun for the week.